The combined capital city preliminary clearance rate was recorded at 70.7 per cent this week, up slightly from last week, when the final clearance rate was recorded at 69.9 per cent. Auction clearance rates have seen a slight improvement across the combined capital cities over the month of July, with the final clearance rate over the last two weeks just falling short of the 70 per cent mark. Auction volumes were higher this week with 1,957 homes taken to auction across the combined capital cities, up from 1,748 last week, and higher than this time last year when 1,610 auctions were held. Perth and Tasmania were the only cities where auction volumes fell over the week. There were 943 auctions held in Melbourne this week with a preliminary clearance rate of 77.2 per cent, increasing from a final clearance rate of 73.8 per cent last week across 833 auctions. Over the same week last year, Melbourne’s clearance rate was 75.3 per cent across 754 auctions. Of the 9 Melbourne sub-regions, 5 recorded clearance rates above 80.0 per cent, with the highest clearance recorded across the Mornington Peninsula, with preliminary results showing 87.2 per cent of the 39 results were successful, followed by the North West where 81.3 per cent of auctions cleared. In Sydney, 704 properties were taken to auction this week with a preliminary clearance rate of 68.0 per cent. Last week, the final clearance rate for the city was 70.3 per cent across 625 auctions, after sitting below the 70 per cent mark for the previous 6 weeks, so it will be interesting to see what the final clearance rate is like on Thursday. One year ago, 509 Sydney homes were taken to auction and the clearance rate was 78.0 per cent. This week, the performance across Sydney’s individual sub regions was mixed. Across the South West region, where 47 of the 50 results have been reported so far, the preliminary clearance rate was 40.4 per cent, while across the Eastern suburbs (90.0 per cent) and Inner West (81.8 per cent) regions, the success rate of reported auctions was much higher. There were 158 Brisbane homes taken to auction this week, with 116 results reported so far. The preliminary clearance rate for the city is 53.4 per cent, up from 46.4 per cent last week and higher than one year ago, when 48.5 per cent of the 156 properties taken to auction were successful. Across the Gold Coast 34 results have been reported so far, with a success rate of 38.2 per cent. This week, Adelaide saw a preliminary clearance rate of 64.3 per cent, with 56 reported results across a total of 80 scheduled auctions. In comparison, over the previous week Adelaide’s clearance rate was 66.7 per cent and 68.8 per cent one year ago. There were 25 Perth auctions this week and so far 15 results have been reported, with 26.7 per cent selling. 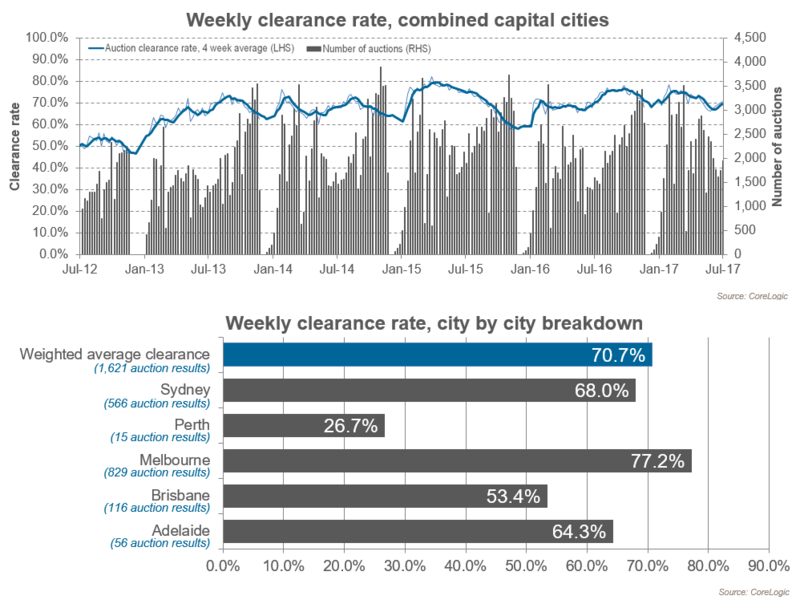 Last week there was a 57.7 per cent clearance rate for Perth. Canberra’s preliminary auction clearance rate of 74.4 per cent across 47 auctions is higher than both last week, when the final auction clearance rate was 71.8 per cent, and last year (74.3 per cent). There were no auctions held in Tasmania this week. In comparison, there were 4 auctions last week, with all 4 recording a successful result.